The Aspire Triton aims to take your wants and desires, and deliver them in a way you have never experienced before. This will be an honest and very useful Aspire Triton Tank System review, giving you the best knowledge to make the best decision for you. This tank gives users the ability to adjust airflow controls in order to change the settings to specified requirements, providing an experience which is totally different and customizable - what else could you need? Just to give you peace of mind, this Aspire Triton Tank comes with warranty and should you need to use it, you will receive expert advice and guidance to get you back on track as soon as possible. I care about product quality and that’s why I will always give honest and reliable product information within this triton tank kit review, to ensure you can make the right choice for your own personal needs. The Aspire Triton Tank gets an amazing 4 stars from me, keep your eyes peeled to find out exactly why I have given this rating. The Aspire Triton Tank is a versatile and dynamic piece of equipment, offering users the ideal piece of kit to get exactly what they need from the vaping world. This kit gives excellent flavors from its 0.4ohm coil and an even better experience when using the 1.8ohm coil – giving a fantastic mouth to lung taste. Even if you are looking for a milder experience, the stainless steel 0.3ohm isn’t as powerful but is just as useful to get your fix. If that doesn’t sound good enough then 3.5ml capacity tank ensures that you won’t have to worry about running out when you need it most. 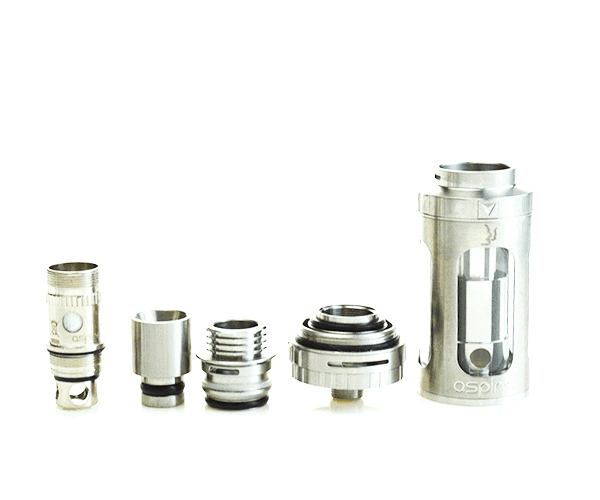 Variety of Coils: What’s perfect about the Aspire Tank is the interchangeable coils that can be used with this tank. Cleverly, the Triton Tank is fully customizable with the Aspire Atlantis 2 coils, making it easier to use 0.5ohm and 1ohm coils with this kit, perfect if you don’t want to and simply can’t buy several tanks. High Quality Tank: The Aspire Triton Tank build quality is above and beyond some of its competitors, and both looks and feels good in your hands. Its small and detailed look shows that Aspire have put in thought and precision into ensuring this kit is the best quality for their customers. Intense Flavors: This Aspire Triton Tank comes with some intense flavors to tickle the taste-buds. The Triton 0.4ohm and 1.8ohm coil heads offer the best flavors in our opinion and far outweigh that of other coils that we tried. The 1.8ohm is particularly good for those looking for a straight mouth to lung experience, deepening and enhancing the flavors. Amazing Air Flow: Anyone who is familiar with the Atlantis 2 will know just how good air flow is. The Aspire Triton Tank’s airflow is just as good, if not better than the Atlantis 2. You are able to choose the draw levels to suit your needs, and can be adjusted using the air flow holes and drip tip holes on the tank. This gives a fantastic choice of options on how you can vape. Overheating Coil: I haven’t talked much about the 0.3ohm coil that can be used on this tank, and that is due to its rather significant issue. It heats up pretty quick and gets surprisingly warm, almost to the point that you can’t touch it. This obviously isn’t great when you want to use this coil on a regular basis. Can’t Take Tank Apart: The triton tank itself does not allow you to take each and every piece of it apart. This is obviously not a major issue but when you want to clean the tank out, especially the glass, you simply won’t be able to get to every piece. Coil Situated Too High: Another minor detail within the triton tank, but always slightly annoying for me. The coil on this pack seems to be situated quite high and means that you end up running dry when there is still a little amount of liquid left in the tank. It just means that there will always be a sneaky little bit of e-liquid left no matter what. Price: The price is always something to be argued about, but the Aspire Kit is priced slightly more expensive that other tanks. This is something which will fix itself over time, just a slight annoyance if you really want this tank. Aspire, which was founded in 2013 is one of the world’s best known e-cig/vaping brands and offers customers the chance to browse their range of tanks other e-cig products worldwide. Here are some of Aspires’ best known products! We have already mentioned the Aspire Atlantis 2 and with its 3ml capacity and has a stainless steel design providing sturdiness and overall high quality. The Aspire PockeX is famous for being just about the same length as an iPhone 5. Don’t let the size fool you though, this little PockeX packs a punch and features a U-Tech coil and a wider capacity for air-flow, making the vaping experience even easier. The trendy looking Aspire Plato is literally a palm sized device, packing in all you could ever want and need for your vaping experience. Coming in a variety of colors, Aspire have really gone of out of their way to ensure a fully customizable experience for all. Wrapping up this Triton Tank review, I feel that overall it has everything in place to be a successful kit, bringing together the versatility of being able to swap out to different coils and the immense ability to vape mouth to lung. The coils have different results for me, with the 0.4hm being flavorful and enjoyable, whereas the 0.3ohm just didn’t hit the spot. The add on of the 1.8ohm is the big talking point with the ability to vape mouth to lung being its stand out aspect. The Aspire Triton has done a lot to improve on previous models, but as always, there is room for improvement.